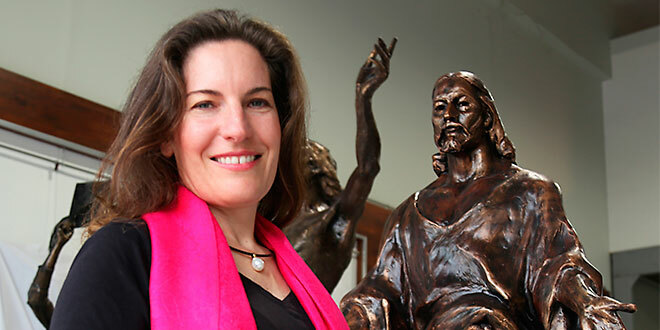 Sacred work: Linda Klarfeld in her new studio on the Gold Coast, sculpting an image of Jesus in clay. RENOWNED sculptor Linda Klarfeld sees plenty of potential creating artworks in her new home on the Gold Coast. “Queensland is the next frontier so, for me, that’s exciting,” Linda said as she prepared for a studio opening at Southport. Her works include both religious and secular themes, and her subjects are the rich, the famous, sporting icons and those closest to her heart and soul – including her favourite, St John Paul II. After 36 years living in Sydney, Linda said she needed a change, so she headed north. “My immediate impression is it is like being on an endless holiday,” she said. “I guess I am inspired by the light, the weather, the friendly people. “It is a very supportive environment it seems. From her new Gold Coast studio she hopes to continue creating artworks that grace church yards, corporate boardrooms and private collections across Australia. Her works include busts of Tony Abbott, Gai Waterhouse, Victor Chang, Alan Jones, and cricketers Keith Miller and Bill Woodford. She doesn’t shy from the prospect of tackling some of Queensland’s sporting greats, in the spirit of the bronze statues of Wally Lewis, Darren Lockyer, Mal Meninga and Arthur Beetson erected outside Suncorp Stadium in Brisbane. However it is religious art that most inspires Linda. “I do a lot of work for the Catholic Church – it makes up more than fifty per cent of what I do,” she said. 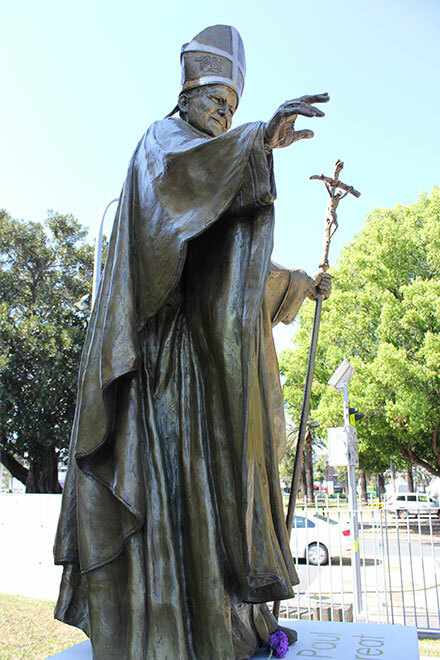 One of her most notable public works is a bronze monument dedicated to St John Paul II that stands in the forecourt of St Patrick’s Cathedral in Parramatta. It took two years to complete and was unveiled in 2015. Dedication to World Youth Day: Linda Klarfeld’s installation of St John Paul II in the forecourt of St Patrick’s Cathedral in Parramatta. The sculpture celebrates the spirit of World Youth Day – capturing the pope-saint together with statues of young people taking selfies, wearing flags and giving the “thumbs up”. For Linda, born in the former Czechoslovakia but raised in Australia, it was a work with a deep and personal meaning. “Pope John Paul II is my favourite pope because he was instrumental in helping to end communism in Eastern Europe,” she said. The Klarfeld family fled to Australia when Linda was aged four, during the height of the Cold War. “We escaped and couldn’t return because you would be imprisoned or disappear. Nobody thought communism would ever fall,” she said. However, when the Berlin Wall fell in 1989 the Cold War began to thaw across eastern Europe. Linda was a high-schooler at the time. “Nobody could believe it,” she said. “I went back there (the Czech capital Prague) when I was seventeen. I went back there on my own to see my grandparents for the first time. Returning to Australia, Linda started years of study, slowly learning the highly technical art of sculpting. “I studied for seven years as a sculptor’s apprentice. It was like learning a trade,” she said. And as her artistic skills grew, she felt her faith grow too. “I didn’t discover anything in the Church until I was about twenty when I got my first commission to do the Stations of the Cross – obviously a massive project for a twenty-year-old – who had absolutely no idea even what the Stations of the Cross were,” Linda said. Projects for the Church now make up more than 50 per cent of Linda’s work. She said “it’s nice to work with Church people” because they are knowledgeable about art. “… A lot of Australians don’t know sculpture that well, but a lot of people who have grown up in the Catholic Church do, and they know art a lot and they are well educated and the Catholic Church in particular has a history of collecting fine art from masters. Her new studio – Klarfeld Bronzes – opens in the Southport Trade Centre this month.